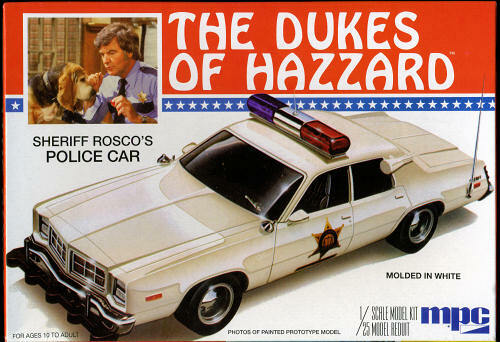 The television series The Dukes of Hazzard followed Bo and Luke Duke, two cousins living in a rural part of the fictional Hazzard County, Georgia, racing around in their modified 1969 Dodge Charger R/T, The General Lee, evading corrupt county commissioner Boss Hogg and his inept county sheriff Rosco P. Coltrane. Bo and Luke had been sentenced to probation for illegal transportation of moonshine - their uncle Jesse made a plea bargain to stop brewing moonshine in return for the boys to forgo jail time and instead be placed on probation. As a result, Bo and Luke were not allowed to carry firearms (they often used compound bows, sometimes tipped with dynamite) or leave Hazzard County (although the exact details of their probation terms varied from episode to episode; sometimes it was implied that they would be jailed for merely crossing the county line; on other occasions, it was shown that they may leave Hazzard as long as they were back within a certain time limit). Corrupt politician Boss Hogg, who either ran or had fingers in just about everything in Hazzard County (and whose exact powers, much like the terms of the Duke boys' probation, often varied in different episodes) was forever angry with the Dukes, in particular Bo and Luke, for eternally foiling his crooked scams and was always looking for ways to get them out of the picture so his plots had a chance of succeeding. Many episodes revolved around Boss trying to engage in an illegal scheme with criminal associates. Some of these were get-rich-quick schemes, though many others affected the financial security of the Duke farm, which Boss had long wanted to acquire for nefarious reasons. Other times, Boss hired known criminals from out of town to do his dirty work for him, and often tried to frame Bo and Luke for various crimes such as bank robbery (thus resulting in imprisonment and allowing Boss easily to acquire the Duke farm). Bo and Luke always seemed to stumble over Boss' latest scheme, sometimes by curiosity, and often by sheer luck, and put it out of business. Due to their fundamentally good natures, the Dukes often wound up helping out Boss Hogg, albeit begrudgingly. More than once Boss was targeted by former associates who were either seeking revenge or had turned against him after a scheme unraveled in any number of ways: Boss' greedy nature, Rosco's bumbling, the criminals simply outsmarting the two or their consciences came to the surface. Sometimes criminals who were even more crooked and ruthless than Boss came to town. Sheriff Rosco also found himself in trouble more than once. On such occasions, Bo and Luke usually had to rescue their adversaries as an inevitable precursor to defeating the bad guys; these instances became more regular as the series went on. As a result of the popularity of this TV show (of which your editor has been blessed by never seeing a complete episode), MPC released several car kits related to this show. The 1969 Charger 'General Lee' was the most popular of the kits and there was a Daisy Duke Jeep and the police car that is the subject of this kit. 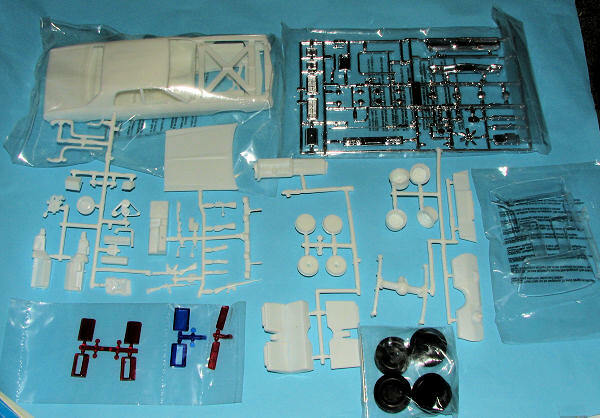 For those who are not used to MPC kits, they were generally the lowest quality and poorest engineered kit of all the various car kits made in the US. However, nostalgia has a way of making these minor foibles disappear in the minds of older modelers; until they start to build one of the reissues. I have the feeling that this police car will be much the same. Several different cars were used during the show, but I'm thinking this was a 1977 Dodge Monaco. It has a full engine with most of the suspension molded into the bottom of the lower chassis. A full interior tub is provided with the proper seats for a police car and a lot of appropriate police equipment including several guns. The light bar atop the car has the lenses molded in blue and red and the car has the larger front bumper, cheapie wheels and antenna that you'd find on these cars. The kit isn't in bad condition as I found little more than a bit of excess flash. No sink areas, but the usual ejector pin marks. Detailing is what we'd call 'soft' compared to new mold kits. There are four oversize vinyl tires includes. By oversize, they are considerably wider than one would find on a standard sedan, but appropriate for a police package. The chrome plating is particularly well done. Of course, MPC is long out of business with AMT/ERTL owning the molds and producing kits for those who have the money to do so. This case it is 'Round 2' that have bellied up the loot. The instructions are standard MPC style with generic color references and well drawn construction steps. 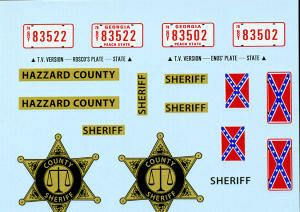 The decal sheet provides the markings and is a bit thicker than what one may be used to, though well printed. I have to comment on the box which is rather flimsy for a two part box. The cardboard used is like we used to see on old Soviet kits and not of the best quality. Though the box top looks thick, it is merely folded under for the bottom half inch to add some structure to things. I know, a minor point, but it did strike me as a bit cheap. Made in China, of course. OK, so 'serious' modelers will probably shun it, but many will buy it and though I'm sure it won't fall together, it will make for an interesting model when one gets done with it.